The above graph shows the notable increase in the RSPM levels of the city before Diwali day and on Diwali. Due to the excessive use of fire crackers by the city residents and the adjoining states of Haryana, Punjab and Himachal Pradesh, the RSPM level of the city reaches to the dangerous level every year. 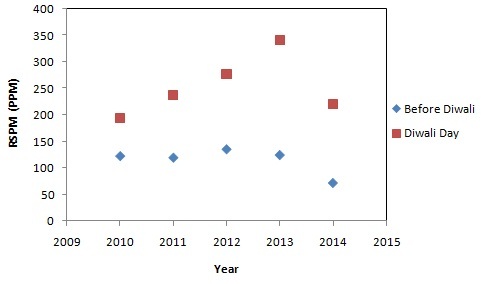 The maximum increase in RSPM till date was observed for the year of 2013, however due to increasing awareness among the people through FM radio, newspaper advertisements, newsletters, campaigns by eco clubs and schools organized by Environment Department, Chandigarh, the difference has been notably decreased in the year 2014.